Today’s excitement started early. After birding the usual places around town, we headed up to the Warbler Willows. I walked over and spotted a sparrow! I called to Barb and she came over and saw it as well. 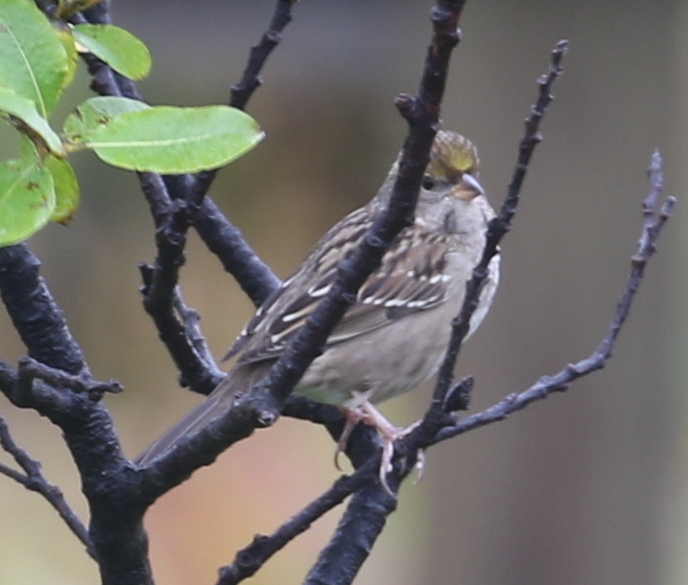 It was an immature Golden-crowned Sparrow! As far as we know, this is only the second record for Adak. 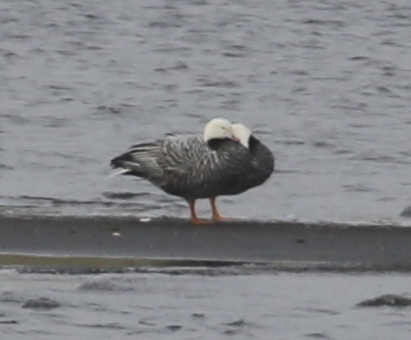 Not a lifer, but an Adak bird for us and an Adak Year Bird for us. This set a Year’s List record for us — 91. As we were driving around, we noticed that the number of longspurs seemed to have dropped. They are finally starting to move out. At the Seawall, there were at least a dozen Horned Grebes and 4 Red-necked Grebes. Also, the numbers of Common Murres were way up — over a hundred — when earlier in the trip we were seeing only a few at a time. When we got back around to the west shore, I walked the peninsula and marsh edge. There was nothing out on the peninsula, but as I walked the marsh edge, three Sharp-tailed Sandpipers and a peep flushed in front of me. They landed not far ahead of me, so I approached slowly. I got good looks at two of the Sharp-tails, but could not see the peep. 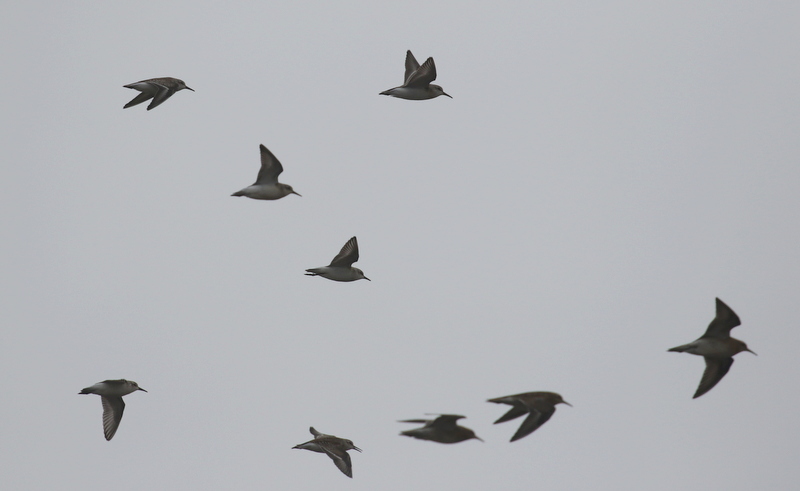 They then flushed again, but this time were joined by many other Sharp-tails, Pectorals?, and peeps! There were about 15 birds in all. 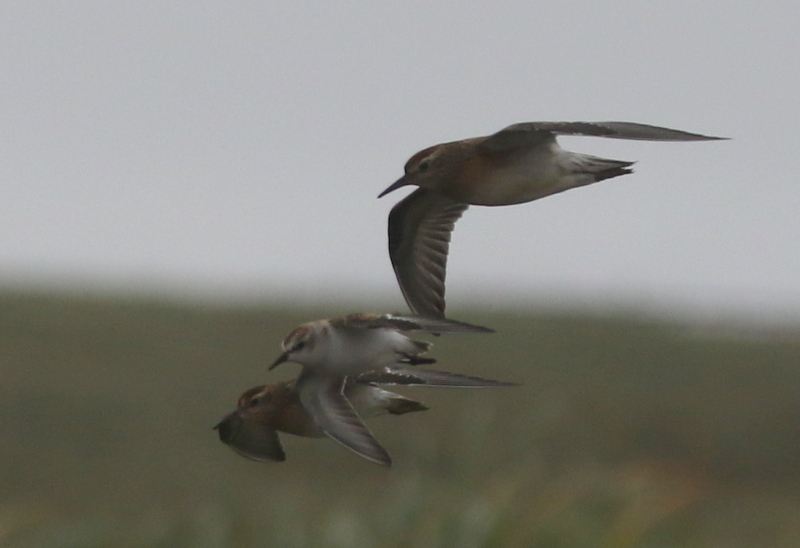 They flew back and forth and around, and I was able to get some flight shots. 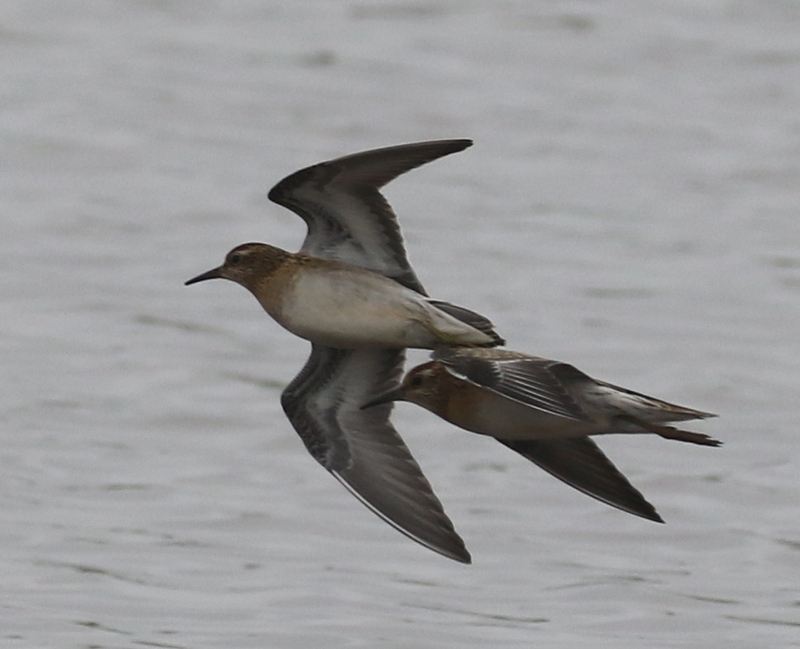 I don’t know what the peeps were, most likely the Western Sandpipers we’ve had the last few days, but I will study them more and ask others to look at them to see if we can figure them out. Here are a couple of the photos. When we got back near town, we decided to watch the plane arrive. However, a fog bank rolled in just before it was due. When the runway lights came on, we new it was near, even though we couldn’t see it. We then heard it approaching — from the west! — and as it neared the runway (still not visible), it accelerated and aborted the landing. It flew off beyond our hearing, but the emergency vehicle stayed out by the runway and the lights remained on — until they didn’t! The emergency vehicle drove up to the other end of the runway, so we figured the jet was in a holding pattern, waiting for visibility to improve. It did. After about 15 minutes, the fog lifted enough that we could see Zeto Point again, the runway lights came back on and the plane came in and landed. Late, but safe.